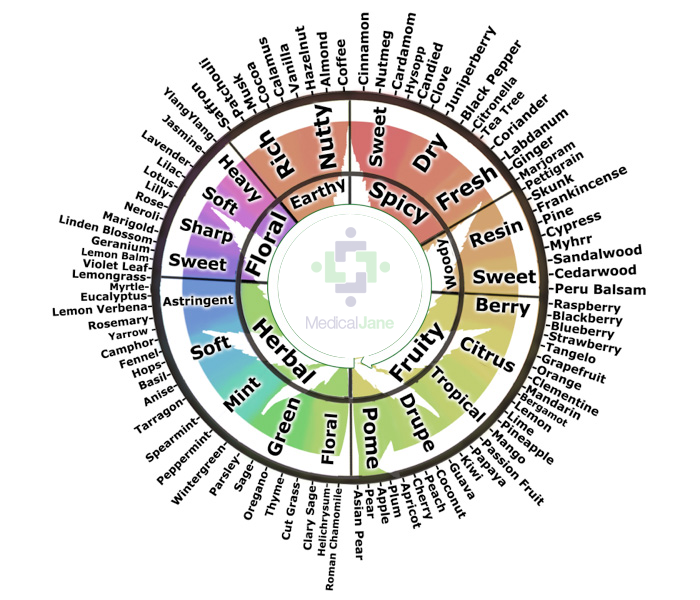 You are here: Home › Blog › Terpenes in Cannabis: What are Terpenoids in Marijuana? Terpenes in Cannabis: What are Terpenoids in Marijuana? The answer is terpenes. Terpenes (TUR-peen) are a large class of organic hydrocarbonsproduced by a wide variety of plants, and are referred to as terpenoids when denatured by oxidation (drying and curing the flowers). They are the main building block of any plant resin or “essential oils” and contribute to the scent, flavor, and colors. Some are even known to have medicinal value. Terpenes are the main class of aromatic compounds found in cannabis and have even been proven to interact synergistically with cannabinoids to provide for a range of different effects. While many people believe that it is the sticky glands of THC (delta9-tetrahydrocannabinol) that provide cannabis with its peculiar aroma, it is in fact the more unstable monoterpenes and sesquiterpenes that are responsible. In fact, it is the smell of the specific sesquiterpene,Caryophyllene oxide that drug dogs are able to detect when probing for cannabis. Greenly is now delivering to Orange County!